The Parish Council resolved, at its November 2016 meeting, to submit the Neighbourhood Plan and its supporting documents to Gedling Borough Council. A summary of Calverton's Neighbourhood Plan process is outlined below. The Neighbourhood Plan has been prepared by the Neighbourhood Plan Working Group on behalf of Calverton Parish Council, as the relevant qualifying body, (under Section 38A(12) of the Planning and Compensation Act 2004) for the Neighbourhood Area covering the Parish of Calverton, as designated by Gedling Borough Council on 16 January 2013. The name of the neighbourhood area is the 'Calverton Neighbourhood Area'. Since the designation of Calverton as a neighbourhood area, various elements of consultation has been undertaken regarding the future planning of the village. The Neighbourhood Plan Working Group on behalf of the Parish Council undertook between November 2013 and January 2014 early work on the potential options for the Neighbourhood Plan. Public consultation was undertaken via an online questionnaire available on the Parish Council website and via a paper based questionnaire. In March and April 2016 the Neighbourhood Plan Working Group undertook Issues consultation which involved liaison with Gedling Borough Council, statutory consultees, local organisations and local residents. A meeting has also been held with the prospective developer of the main housing allocation. The consultation undertaken was in excess of the statutory 6 week period as the Neighbourhood Plan Working Group felt that it should be extended having regard to the summer holiday period. Statutory consultation was undertaken utilising the consultee details previously supplied by Gedling Borough Council. Consultation was also be undertaken with local residents and businesses, including those who had commented previously at the Issues stage. Public consultation took the form of 6 drop-in sessions at Calverton Baptist Church on a weekly basis over the last 6 of the 9 week consultation period. These sessions included two of each: weekday daytime, weekday evening and weekend drop-in to allow access opportunity for as many people as possible. A further drop-in session was also held at the opening of the village hall. The Neighbourhood Plan Working Group on behalf of Calverton Parish Council has considered all of the responses made and has made a number of amendments to the Plan in response to the comments received, including those received from Gedling Borough Council as the Local Planning Authority. Calverton Parish Council, as the relevant qualifying body, (under Section 38A(12) of the Planning and Compensation Act 2004) for the 'Calverton Neighbourhood Area' hereby resolves to Submit the Submission Version of the Calverton Neighbourhood Plan to Gedling Borough Council in accordance with Regulation 15 of Neighbourhood Planning Regulations 2012. The required supporting documents will also be submitted. 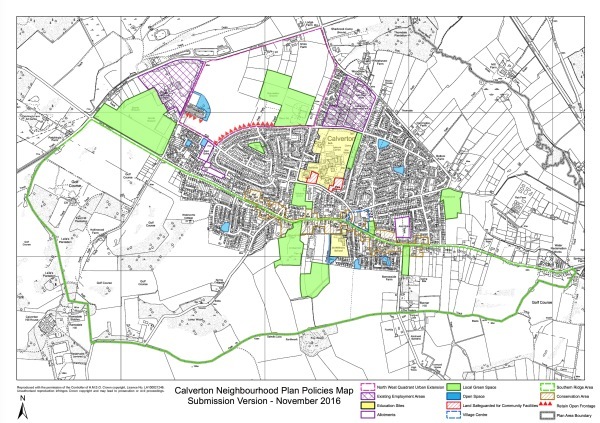 At the meeting of the Parish Council on the 8 November 2016 they resolved to submit the Calverton Neighbourhood Plan in line with the above recommendation. The Submission Version of the Calverton Neighbourhood Plan was submitted to Gedling Borough Council on 14 November 2016. The Borough Council will now be responsible for: organising a statutory 6 week consultation under Regulation 16 of Neighbourhood Planning Regulations 2012; organising a public examination under Regulations 17 and 18 of Neighbourhood Planning Regulations 2012; and making a decision following public examination under Regulations 19 and 20 of Neighbourhood Planning Regulations 2012. The timescales for these stages of the process are in the hands of Gedling Borough Council, however the statutory consultation is likely to commence in early January 2017. The Parish Council, through the Neighbourhood Plan Working Group, will work closely with Gedling Borough Council during these final stages of producing the Neighbourhood Plan. Calverton Neighbourhood Plan - What is neighbourhood planning? Neighbourhood planning gives us direct power to develop a shared vision for Calverton and shape the development and growth of the area. We are able to choose where we want new homes, shops and o ces to be built, have our say on what those new buildings should look like and what infrastructure should be provided. Neighbourhood planning provides a powerful set of tools for the people of Calverton to ensure that we get the right types of development for our community, provided our Neighbourhood Plan is aligned with the strategic needs and priori es of the wider local area. Neighbourhood planning provides the opportunity for Calverton to set out a posi ve vision for how we want our community to develop over the next ten, een, twenty years in ways that meet iden ed local need and make sense to our community. We can put in place planning policies that will help deliver that vision.